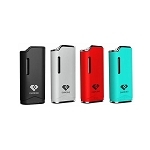 The Mini K Box Kit by the company Kangvape combines an eye-catching appearance with advanced variable output control and wide compatibility for an all around amazing experience. It is built with a premium aluminum and zinc alloy construction that is finished off with sleek polished aluminum gold colored plates. The luxurious gold coloring is matched by the included refillable essential oil tank atomizer. This glass oil cartridge easily installs in the Mini K Box's 510 thread connection that supports most atomizers measuring up to 11.2 in diameter. It has a high performance wickless ceramic core element, leak-resistant cup style structure and adjustable airflow control with matching gold accents. 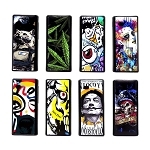 It is powered by the cutting-edge Mini K Box 400mAh lithium-ion battery. This device incorporates three preset voltage power settings that makes it ready to heat a wide range of concentrates in a moment's notice. The entire device is easily controlled using one button. With five rapid clicks within 2 seconds you can unlock the Mini K Box for a quick session or lock its functions for safe travels. Three fast presses on the control button will adjust it's power output setting and two clicks begins a preheat cycle (green LED). There is an LED light indicator on the top of the device that shows which voltage output you have selected (3.4V Red, 3.7V Blue, White 4.0V). Each time you let go of the control button the button will flash a second time to constantly keep you up to date with it's remaining battery life (White 100-70%, Blue 70-40%, Red 40-10%). 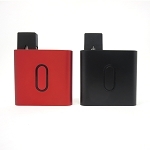 At about 1.8" tall and just over 1.5" wide, Kangvape's Mini K Box easily hides in the palm of your hand for stealthy sessions on the go and drops into a pocket for discreet/comfortable travel. Invest in yours today and enjoy your favorite concentrates easily on the go anytime in style.